The reason you should have a strong Rental Agreement. A rental or lease agreement is a legal binding contract between a landlord and a tenant that describes the rules to follow for each party in their relationship. Rental agreements could be long, they could be short, they could be nicely printed on legal paper, or they could be hand typed. Whatever your case may be, you as a landlord need to be sure that you cover the basics; and more! Rental agreements need to disclose important factors such as how much the tenant will pay a month for the property, how long the tenancy will last, and what would happen in the event that the tenant would to forcibly opt out of the contract. Along with these crucial clauses, we could also find other important business related details. Here are some of the more important clauses that you need to be sure to include in your rental agreement. Terms. – Having the terms listed with detail is a very important factor in your agreement. There are usually two types of leases. The first is usually just called a Rental Agreement where the lease is month to month and doesn’t specify a certain length of lease. This is great for vacation area properties, and landlords who are a little skeptical about the area where the property is located, or student prone areas near universities and colleges. The other type is a fixed lease agreement. 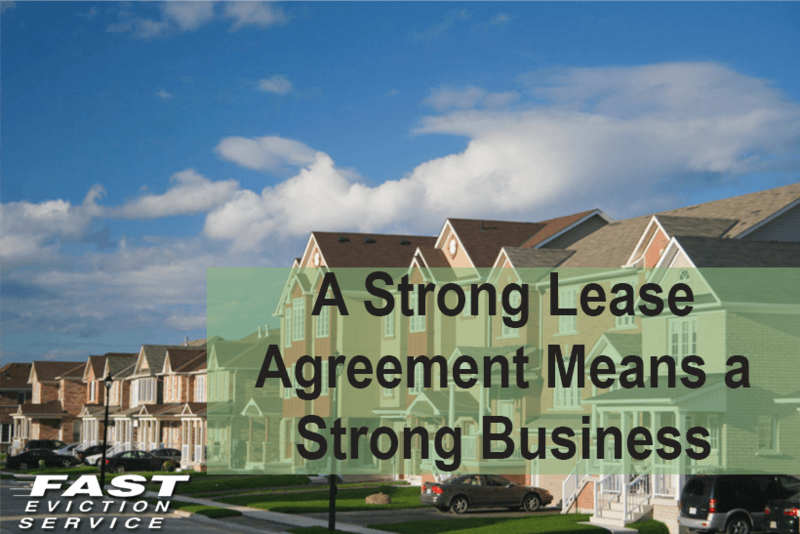 This agreement secures a tenant usually for a year, although 2-5 year agreements also exist. The latter would be for more stable residential areas where it’s more common to have families settle down. Whatever lease you are offering, make sure your intentions are well portrayed in your document. Names. – Names of all adults that are to live in the rental unit should be mentioned as tenants, and should also sign the lease. This needs to be implemented so that all adults adhere to your rules and regulations. In case any of the adults should break any part of the agreement, you have legal bounds to evict everyone from the rental property. In case of non-payment of rent, you are also protected by the fact you can charge anyone on the lease the full amount of the stated rent. Another factor to consider important is the number of occupants the property is entitled to have. If you are a lenient tenant and would allow more occupants than the ones mentioned in the lease, then make sure you have a clause where they need to notify you in writing, otherwise state that in under no circumstances, should there be anymore occupants than the ones listed in the original agreement. Rent. – Putting the amount of the rent on your lease is important, but stating what would happen in certain circumstances is even more important. For example, the tenant pays you with a check, and the check bounces. What then? Things to consider when it comes to rent include whether you will charge any late fees, is there a grace period for rent, or is it due on a specific date? Check bouncing fees, and acceptable methods of payment are also a must in your lease agreement. Security Deposits. – Security deposits are often a pain in the neck and more often than not, cause a lot of problems when it comes to what the tenant thinks they are entitled to, or entitled to do with it. The first thing you need to get rid of their idea bank is to be able to use it as any type of month’s rent whether it’s first month, last month, or a tough month. You will be frequented by the typical “Can I use it for this month’s rent, and I’ll replace it next month, I promise!” You need to state how much the security deposit is (usually one month’s rent, but check your local laws on the maximum limit you can hold), what you can use it for (repairs for damages, bailing out on lease, etc), and how and when it will be returned to the tenant (usually a specific amount of days after the keys are returned, by check). In the event you allow pets to reside in your property, you need to specify how much, if any, of the deposit will be retained for clean up. Try to avoid any “hey, that wasn’t in the lease agreement” situations by being very meticulous on this part. Illegal Activities. – This is a lot more important than a lot of people care to admit, and is often left out of the lease agreement maybe for common sense’s sake. There is no common sense when it comes to lease agreement. Make sure you specify what would happen if any illegal activity is suspected on the property, and also mention as many illegal activities as you can, such as smoking marijuana without a license, drugs dealing, etc. How common areas are to be handled. Maybe you have a garden with a grill, a small park, or any other areas shared by multiple tenants. Parking needs to be covered in detail, where visitors need to part, if there is an assigned spot per unit, etc. Entry to the unit for repairs and or complaints if the tenant isn’t home also needs to be covered. The tenant needs to know how you will act if this scenario ever becomes a reality. A solid rental agreement could save you a lot of money in the long run. Having a lawyer check your wording and editing it isn’t a bad idea either. It’s a good couple hundred dollar investment for saving yourself thousands of dollars and legal headaches in the future. What Are Your Rights If The Tenants Break Their Lease Agreements?